This week, we have a Color Challenge!!! 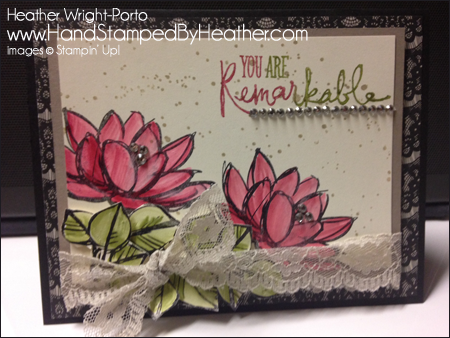 It's holiday colors, but my card is every day and featuring the Remarkable You stamp set! But don't worry, you'll get plenty of holiday card ideas in today's Blog Hop! Tried watercoloring again, but this time went back to my comfort zone and used a Blender Pen (as I have yet to master the Aqua Pen!). Notice the different shades of green and red. Love the look. Enjoy! To try and show you the depth of the card and layered leaves (using Stampin' Dimensionals). This card would therefore not lay flat in an envelope...especially with the ribbon added. Stamp the flowers from Remarkable You on the Very Vanilla cardstock in Staz-On ink. Then stamp 2 sets of leaves on scrap Very Vanilla cardstock as you'll cut them out and append to the card (using Stampin' Dimensionals). Then color the flowers with Real Red, the leaves with Mossy Meadow. Of course, I love the bling...I think I got that from Michaela...so I added the Rhinestones for a little sparkle. But then also love lace ribbon...and it compliments the lace pattern designer series paper piece (from Timeless Elegance DSP). I used Sahara Sand Lace Trim. Love that..can you tell? Adhere floral piece to Tip Top Taupe cardstock. Then adhere lace pattern paper to black card stock. 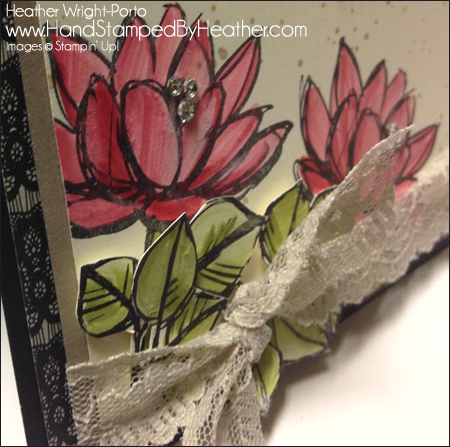 Then adhere the floral piece to the lace pattern using Stampin' Dimensionals. Oh Heather, what a great take on the color theme. I love all the detail and the lace ribbon is perfect. Heather, I just love this card and will be casing it I'm sure!! Too pretty! I do love the bling you added, too. So pretty Heather! Love the fussy cut leaves, great use of the colors! Beautiful! Elegant---just beautiful. Thank you for sharing this beautiful idea. OK you are remarkable!!! Fussy cut leaves ...wow. Love how all the colors came together. Hi ladies!!! Aw...thanks :D What a great way to start my day in coming and seeing all the beautiful comments! Thanks you so much!!! Have a great weekend. And Happy Stamping!!! !